The cave is located in the Pasir hamlet, Junjung village, Sumbergempol subdistrict, Tulungagung. Pasir cave is kind of hermitage which contains many reliefs, sculptures Dwarapala, and fragments of statues of Ganesha, the legacy of Majapahit kingdom. 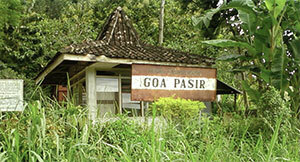 Around this location there is an ancient tomb, local residents called Mbah Bodho. In front of this ancient tomb there are several statues, pedestals, miniature buildings, Padma and dismembered ancient stones. In contrast to the cave in general that has many interconnected hallway, in Pasir Cave there is only entrance cave that leads to the northeast with a length of 430 cm, a width of 190cm and 150 cm niche. Historically, this cave was used as hermitage by Rajapatni, Hayam Wurukâs grandmother, who died in 1350 AD and his ashes interred at Boyolangu temple, about 12 km from the location of Sand Cave.